You’re wanting to get into better shape and walking just doesn’t cut it, so you’re wanting to start a jogging program. Running has proven to be one of the most affordable activities which provides for an excellent aerobic workout, all with the benefits of natural fresh air instead of from a stuffy gym. Jogging however isn’t the most conventional of choices when it comes to fitness. Most think that jogging is boring, and it looks painful. There’s also the need to fight the elements such as hot summer humidity or freezing winter cold. There’s also too few sidewalks, too many barking dogs, too much traffic, so they’d rather just conform to the safety of their treadmill or stationary bike indoors. 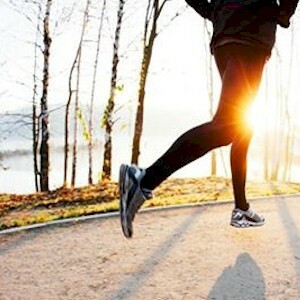 But once you learn the basics and get trained to run properly, this by getting the proper footwear and clothing, and then learning the correct techniques such as stretching, running as a fitness activity can become a savior. • Hot Dry Weather – On hot summer days, the best is wearing fibers which extracts sweat from the body. The fabric should be light and breathable which prevents the body from overheating which will exhaust you quicker. To further reduce fatigue, always wear a hat as well as sunglasses, this to protect your skin while shielding your eyes from glare. • Damp Wet Weather – Jogging in the rain is a completely reinvigorating experience as you’re getting the purest fresh quality of oxygen that’s available anywhere. But to ensure that you don’t get the chills or catch a cold, wear a light waterproof shell on top to repel exterior moisture, and a dry-fit material underneath to remove moisture from the body. You should also consider dry-fit leg wear to keep your legs warm and dry, or just water repellant shorts if the temperature is suitable. There are jogging shoes which can cost in the hundreds, which is your biggest investment. When choosing the best shoe for your body type, always consider the surface that you’ll be running on, the climate, and for some, how trendy to look. There are a wide variety of running shoes built for almost everyone, for almost every foot type. There are also a massive rainbow of colors to choose from, neon, glow in the dark, etc. • Running On Trails – If you do a lot of trail running on uneven or rough terrain, what you need are soles and the canvas to be slightly thicker material, which protects your feet better. Also choose darker colors of shoe to hide the dirt. • Running On Flat Smooth Surfaces – Flat smooth paved or concrete surfaces are the most common conditions that most will be running on the most. Also decide if you need to be visible to traffic if you run by the side of the road, or if you live in a dry humid or rural area, where you would need lighter or thinner more breathable material for your shoe. • Bare Minimal Running– There’s been a movement lately to run minimalist, as some will run almost barefoot. What this type of running does is it embraces the core natural mechanics of the foot and the body. What this type of thin soled footwear offers is the least support possible, usually cardboard thin, which allows for maximum natural movement of the foot as it was intended. A word of caution if you’re planning on minimalist running is to begin with short distances such as 1 kilometer, and then work up from there. You’ll initially feel stiffness and soreness from the additional pounding on your calves. Most likely, your ideal running shoe falls somewhere in between. Most specialty running shoe stores will be able to advise you on the proper fit and type of support for your weight, body type, and instep. But beforehand, know the most common surface that you’ll be running on, and what the most likely weather conditions will be. Running is duplication of motion as it uses the same exact forward motion using the same muscles for every stride you take. So because of this, the same stress related injuries will usually occur. If you happen to feel too much pain from stretching, or pain before or during a run, then don’t try to labor through it. Instead, do some other type of activity or just gently re-stretch the sore areas that day. Running when injured just makes it worse and more difficult to heal. Running although it’s a solitary act doesn’t need to be. In fact, it’s recommended that you join a running club with other novice runners who are just getting started. They usually meet a few times a week where like minded people will go through the same issues you will, while offering each other support and motivation. If you can’t find a running club, then find a friend. Everything’s easier and more enjoyable once you have support, and running’s no different. Make sure that you have enough fuel for your runs. Just running on willpower alone usually won’t get you that far, but will get you exhausted and sore instead. Begin with proper hydration by drinking at least half a liter of water a couple hours before your run. Then drink a bit more right before starting. Depending on how much you sweat, how hot and humid it is, or how long your run is, you should also be drinking anywhere up to 2 liters of water 4 to 6 hours after the run. If you go for long runs, then consider protein based sport drinks or gels which are loaded with electrolytes, along with energy bars which contains carbohydrates that will refuel your energy quicker. It’s proper nutrition which allows you to run further and faster with less pain, while allowing you to recover which gets you ready for your next run tomorrow.